With big summer festivals, concerts by national headliners, and a vibrant local scene, Taos is making noise as music town. 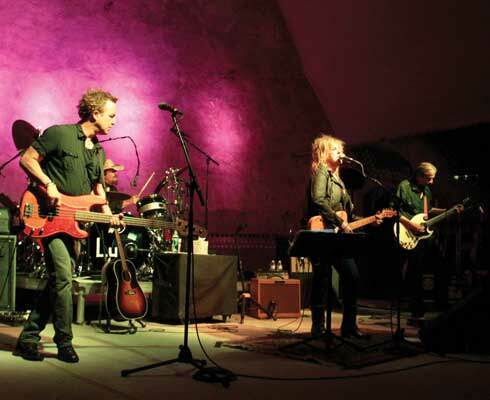 Above: Lucinda Williams performed last summer at Taos Mesa Brewing‘s amphitheater, a venue that’s helping to put Taos on the music map. LUCINDA WILLIAMS swaggered onto the Taos Mesa Brewing outdoor stage, a Precambrian clamshell set against the backdrop of an indigo sky shot through with blazing orange highlights. The crowd hushed with anticipation—last August it was still a rarity to see an artist of this stature north of Santa Fe. I was at the top edge of the amphitheater, a couple hundred feet from the stage, but close enough to see the expressions on Lucinda’s face. Bathed in neon pink and purple light, she looked up at the golden half moon and smiled. Then the first notes out of her mouth reached down and ripped out the hearts of 1,200 eager fans. “There’s something really cool going on here,” Williams said after the gig. Taos’s cool factor is cranking up again this summer, thanks to a concert lineup that kicks off with the second annual Music on the Mesa festival June 3–5, headlined by Steve Earle and Shawn Colvin. On August 6, Alabama Shakes—in the midst of a world tour after winning four Grammys earlier this year—takes the stage in Kit Carson Park. And in September, Michael Hearne brings the season to a close with the 14th annual Big Barn Dance Music Festival, a roots music family gathering of mythic proportions. Along with the festivals and the big shows by touring headliners, Taos is home to a thriving community of local musicians playing in supportive venues for enthusiastic audiences. The town has turned into a mecca for music lovers. You might even say it’s humming. From top, left to right: John Henderson, Lisa Joyce, Don Conoscenti, Stephen Plyler, Carol Morgan-Eagle, Dan Irion, K Bolan, Jenny Bird, Randy Morris, Kevyn Gilbert, Mina Tank, Jerry Schwartz, Jennifer Peterson, Bob Andrews, Daniel Pretends Eagle, Peter V., Susan Dilger, and Jimmy Stradler are among the musicians, producers, promoters, DJs, venue owners, and others who keep the Taos music scene humming. A few years before Lucinda discovered the happening Taos music scene, I stumbled upon it myself. My husband and I are both huge music fans. Back in the 1990s, I worked at Sons of Hermann Hall, a legendary venue in Dallas, where we still spend part of the year. My husband’s a radio DJ. We go out to hear live music regularly, and every now and then we host a backyard concert featuring some artist you might even have heard of. So tearing ourselves away from Texas was tough—until we found Taos. During the summer, we meet up with friends each Thursday evening at the plaza, where crowds stream in for free entertainment and dancing under the stars. A few steps away, at the Alley Cantina, bluesman John Carey may be setting up for his gig in the 400-year-old adobe bar. Once a New Orleans mainstay, he still tours internationally, but Taos is home. At the Black Mesa Winery’s tasting room, the happy-hour entertainment might be former Lost Gonzo Bob Livingston, from Austin. Down the street at the Taos Inn, you never know who you’ll run across. I walked in one evening to the sweet sound of Susan Gibson singing “Wide Open Spaces,” the breakout hit she wrote for the Dixie Chicks. With at least 10 venues to choose from every night of the week, we’re always making tough calls: a blues guitar god at Taos Mesa Brewing or a Latin dance band at KTAO Solar Center? Or would we rather enjoy flamenco music during dinner at the Kyote Club and later two-step to a country band at the Sagebrush Inn? This embarrassment of riches is due in part to John Henderson and Jerry Schwartz, who founded their production company, Roots and Wires, in 1999 to bring American roots and world music to town. They’ve nurtured the scene like two proud papas. “It’s a labor of love,” says Schwartz, who also runs a landscaping company. They’ve come a long way from the days when finding a venue to host live entertainment was a challenge. Many of the Roots and Wires shows are held at Taos Mesa Brewing, the brainchild of founding partner and musician Dan Irion. Years ago, he and his band rehearsed in a warehouse near the present site. The impromptu underground gatherings around their music raised quite a ruckus, and they were evicted. Now that he’s in charge, Irion likes to maintain that vibe. 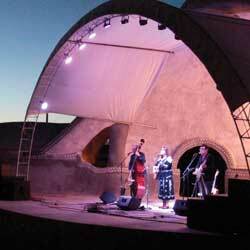 The country singer Suzy Bogguss at the Taos Mesa Brewing amphitheater. To house their new venture, Irion and his three partners erected a shining silver Quonset hut just east of the Río Grande Gorge. They put in a spacious stage and a dance floor, a brewery in the back, and a bar in the front next to a floor-to-ceiling glass wall with mountain views. In 2014, they added the amphitheater, which accommodates more than 1,300 people. For major events that draw a lot of out-of-towners, they offer camping spots on the surrounding mesa. Eliza Gilkyson onstage at Solar Fest. There were few venues in the late 1990s when Brad Hockmeyer held the first Solar Fest at KTAO, the 3,000-watt radio station that he grew into a 50,000-watt solar-powered giant. Two years later, Solar Fest moved to Kit Carson Park, and in 2012, when Mumford & Sons headlined, the festival sold 7,000 tickets. “I could not believe that a town this size could put on a show like that,” says Stephen Plyler. But he saw the possibilities. 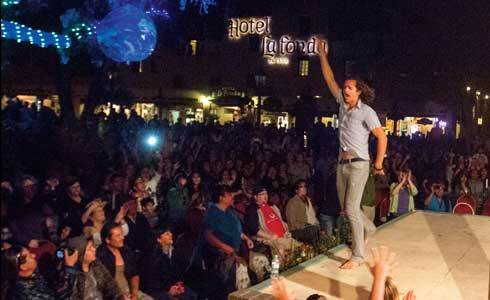 He moved to Taos a year later and started bringing national touring acts to town. He also partnered with Henderson, Schwarz,and Irion to purchase KNCE. They turned it into a funky, old-school community radio station that gives plenty of airtime to local musicians. Plyler and the Brewing crew put on the first annual Music on the Mesa festival last June, followed by the Lucinda Williams concert. 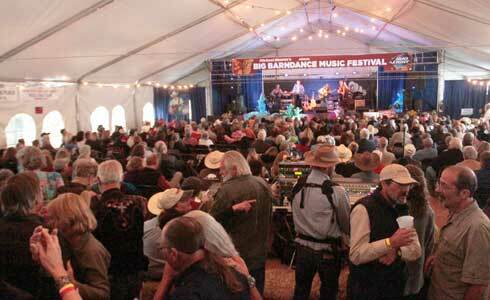 Michael Hearne’s Big Barn Dance, a music festival with roots in Saturday night two-stepping gatherings around Taos. Just north of Taos, in Red River, the musical atmosphere had more of a cowboy flavor. That’s where Michael Martin Murphey, Ray Wylie Hubbard, B.W. Stevenson, and Bill and Bonnie Hearne established the storied Austin-to-northern-New-Mexico connection. These and other upstarts of the budding Texas progres- sive country scene spent much of their time up here laying low and gigging. The crew included the Hearnes’ nephew, Michael, who played guitar in their dance band. Even today, you’d be hard-pressed to find a musician in Taos whose artistic bloodline doesn’t lead back to Michael Hearne. Nowadays, that sound drifts out of venues all across the Taos Valley. Don Richmond, a virtuoso multi-instrumentalist, composer, and producer, seeks a sense of place in his music. “We’re immersed in this ocean of stuff blowing over us all the time,” he says, “but I want to play the music that is from here.” The harmonies and acoustic strings in his band, the Rifters, are as light and airy as the sky above the mesas, and their rhythms reflect the laid-back local attitude. When the Rifters play Old Martina’s Hall in Ranchos de Taos, listeners come from Santa Fe, Albuquerque, and southern Colorado. The vibrations of Hispano wedding bands, Bo Diddley blues riffs, and Junior Brown guitar flourishes live in the hall’s fortress-like adobe walls, the massive hand-hewn vigas, and in the very air the dancers breathe as they glide across the floor. The music spirits seem to inspire everyone who plays in Taos, including the big dogs. There’s no economic incentive for Los Lonely Boys, Keb’ Mo’, Michael Franti, and so many other national acts to play Taos, but for them, it’s an irresistible oasis. “Half of the submissions I’m getting now are from bands who talked to other bands who played in Taos,” Dan Irion says. 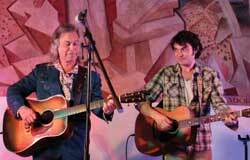 Two-time Grammy winner Jim Lauderdale and Max Gomez play the Mural Room of the Old Courthouse on the Taos Plaza. Some musicians land in Taos for good. Singer-songwriter Max Gomez grew up here, but lit out at 18 for L.A., as any up-and-coming folk-rocker would. A recording contract and national tours with the biggest names in Americana music followed, but when he’s not on the road, he says, “Taos is home. I have family here, a lot of old friends here, and I like writing here.” Now 28, Gomez works on songs with Michael Martin Murphey that connect generations, and he counts the songwriter and longtime Taos resident Mentor Williams (“Drift Away”) among his close friends. On any given night you might find Andrews backing the guitar whiz Don Cognoscenti or powerhouse vocalist Jennifer Peterson. You may stumble on Max Gomez trying out new material with his buddy Rick Fowler, or folk goddess Jenny Bird sharing the stage with Grammy winner and Taos Pueblo resident Robert Mirabal. Apache musician Robby Romero and Taos Pueblo’s Robert Mirabal, a two-time Grammy winner, onstage at the Taos Center for the Arts. The Phoenix-based rock band Kongos draws a crowd on the Plaza. These are moments you thank the music gods for. Some come from local favorite Jimmy Stadler, who performs “Off the Cuff,” a live show that’s recorded for radio, in the performance space at KTAO. Each week during the summer, with a little help from his friends, he covers a different classic-rock legend; this summer, he’s planning an homage to CSN&Y’s Déjà Vu. 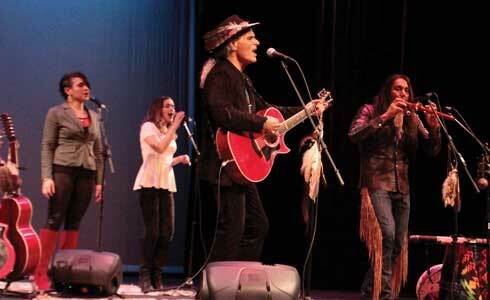 One night, Stadler assembled an all-acoustic band of Taos’s finest to cover the Rolling Stones. My husband shot up to dance to “Jumpin’ Jack Flash” just like he does at a Stones concert, and everyone joined in. The place was packed with tourists, locals, gray-hairs, foxy young things, construction workers—all shaking their booties. And that, my friends, is Taos. Back in 2009, when Dan Irion started dreaming about opening a music venue, Jason Wylie invited him over to taste his latest home brew. Irion brought along someone who knows beer—his dad. “That beer was amazing,” Dad said. 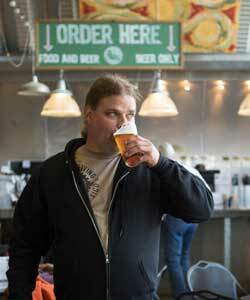 “You should partner up with that guy and start a brewpub.” Taos Mesa Brewing opened its doors three years later and quickly outgrew its initial brewing capacity. Following an expansion last year, TMB plans to open the Taos Tap Room in town this summer. ● BLACK MESA WINERY Taos Tasting Room. Live music Tuesday, Friday, and Saturday, 6–9 p.m. Free. (575) 758-1969; blackmesawinery.com. 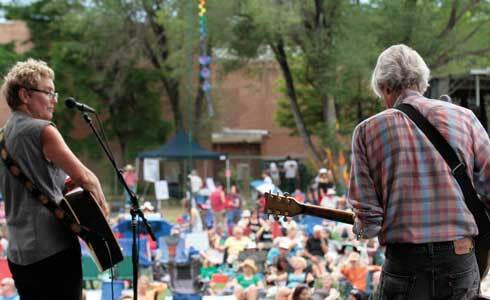 ● SAGEBRUSH INN Live music Friday and Saturday, 8:30–11:30 p.m. Free. HEAR MORE LIVE MUSIC AT GALLERIES, RESTAURANTS, AND OTHER VENUES AROUND TOWN. CHECK TEMPO MAGAZINE IN THE TAOS NEWS OR TAOSNEWS.COM/ENTERTAINMENT.